It’s the new year. People everywhere are planning, setting goals, dreaming about the possibilities for the new year. Regardless of the new year, each day is a new day to make a choice to live with purpose. I want to live my life with purpose – every day! And today, this year, I want to purpose to love my husband more. I want to show more love. I want to have an attitude of love. I want to offer grace and a smile. I want to be the kind of wife who loves unconditionally. In the beginning, loving your husband comes easy. It doesn’t take a whole lot of work to love someone who rocks your world. It’s only when that person you love starts to feel like a rock in your shoe that things get harder. It’s harder to love someone who has irritating habits and bad attitudes. But God never said it would be easy. He never said we’d find love and loving to be easy. My mother always told me – and I’m sure you’ve heard it said before – that love is an action, not a feeling. And it’s so true! Romantic love makes us feel great. It makes us feel alive and special. But true love, the kind of love that lays down it’s life for someone, takes work. Real, true, unconditional love is a choice. It’s a choice we make when we wake up in the morning to love regardless of yesterday’s events. It’s a choice to be love to someone who may not always be lovable. A few years ago my husband and I were really struggling. Life was hard. Outside stressors were piled high and causing us to come unglued. Everyday was a battle to survive and when life is hard it’s so easy to unload all of that stress on the one person in the world who has promised to love you forever and always, for better or for worse. One day when all seemed hopeless, I made a decision to love more. It wasn’t an easy decision. It would have been easier to give up altogether. But I wanted more than that. I decided that even if my heart wasn’t fully convinced that I would “act” like I was happy. And I decided I would make choices that reflected my desire to love and be loved completely. Of course, it takes more than a few motivational quotes to save a rocky marriage. A lot more. But it was a daily reminder of my choice to believe we would make it. To believe we could love more. It’s so easy when resentment and bitterness grip your heart to allow those feelings to simmer at the surface like a kettle ready to blow at any minute. It’s so easy to let your heart bleed. 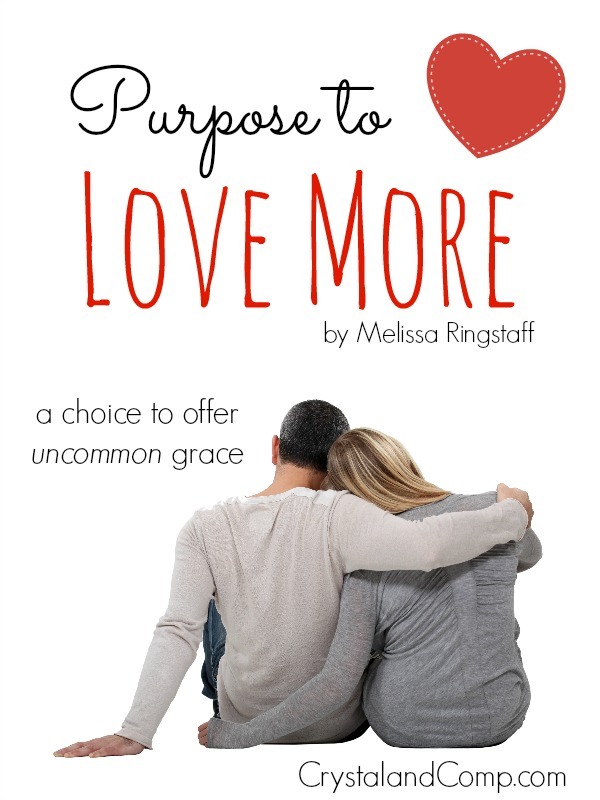 If you really want a great marriage you have to purpose to love more – even when it’s hard. Grace isn’t an offering of ease. Grace is offered when there is no merit. Grace is for those who do not deserve it. And selfless love heals broken hearts. If your marriage feels broken, you’ll have to offer uncommon grace – a daily offering of selfless, sacrificial love to bring healing and wholeness to your relationship. And that kind of grace can only come from God! 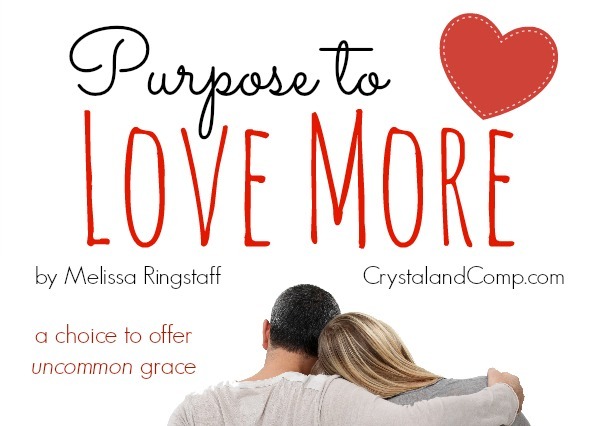 Melissa Ringstaff is a pastor's wife and homeschooling mom. She's been writing at A Virtuous Woman since 2001 and is the author of From Chaos to Calm: 15 Weeks to a Happy Home and creator of "This is My Life" Planners - perfect for the busy mom! Beautifully written post, Melissa. You had a VERY wise mother. I wish all mothers gave the advice your mother gave you. All of our behavior comes out of making choices. We can choose to love or not, be kind, loving, etc. Thankfully, we have the power of the almighty God living within us who gives us the power to walk in love and make good choices! I love the pillow and the quote idea. No, that’s certainly not the answer in and of itself but those visual cues can help so much. A marriage counselor once told us to find 100 hearts of some sort and post them around the house- visual cues to put love first. Too often we let ‘issues’ override the relationship and the hearts (or your pillows and signs) can be a visual reminder not to do that! I’m going pillow hunting! Carol recently posted..I Add Salt to My Food – and I’m not worried a bit! Great message. Many forget that making a marriage work isn’t easy. You have to work at it everyday, and this post sends a great reminder of that. Thanks for sharing!